Did you know that there are thousands of satellites in orbit around our Earth? Humans built those satellites and launched them into orbit to provide us with all kinds of services – communications, scientific data, and the GPS function on your phone are good examples. So much of modern life depends on those satellites, and yet they’re threatened by Space Junk, little pieces of man-made refuse caught in orbit around the Earth. To raise awareness about the dangers of Space Junk, and to spread the word about the possible solutions to this “Near Earth Orbit” debris problem, Flandrau will host a special event: The Trouble With Space Junk. In collaboration with the UA’s Department of Aerospace and Mechanical Engineering, Steward Observatory, and the Lunar & Planetary Lab we’ll offer a range of programming. Visitors can talk to space junk experts, enjoy hands-on activities, experience a one-time screening of the planetarium film Space Junk, and learn from a panel discussion featuring UA space debris experts. Flandrau’s event will be part of the launch of international “Space Debris Day” an annual awareness campaign focused on the issues of this astro-environmental problem, and a day to share solutions for better management of the valuable orbital space around our Earth. On the same day, February 10, 2019, there will be a similar event happening in at MacMillan Space Centre in Vancouver, Canada. What is Space Junk? Over the years some of the satellites that humans launched into orbit have stopped working, and some have crashed into each other and broken into tiny pieces. All those bits and pieces, and the old “dead” satellites, have become “Space Junk” that whizzes around the Earth at superfast speeds. Space Junk in orbit is dangerous for the satellites we depend on, and for the astronauts at the International Space Station. It’s also hard to avoid when new satellites are launched. Experts at the University of Arizona are looking for ways to track, monitor, and clean up Space Junk through a Space Situational Awareness (SSA) initiative. And the date of the event, February 10, is a ten-year anniversary of a famous satellite collision. On February 10, 2009, the functioning Iridium 33 American satellite and the deactivated Kosmos-2251 Russian satellite ran into each other at a speed of 11,700 m/s (26,000 mph). This was the first high-speed collision between two intact satellites in space, generating over 1000 pieces of debris larger than 10 centimeters. The crash served as a wake-up call to scientists and engineers, and propelled the effort to better monitor and manage all the man-made objects that orbit around our planet. Researchers at the University of Arizona plan to make this an annual day of recognition and education: Space Debris Day. Flandrau will offer hands-on activities for visitors and families to learn about Space Junk from 1-4pm. And we’ll have a special Ask The Scientist booth from 1-2pm where anyone can learn about the what, where, and why of Space Junk directly from UA graduate students and researchers. The planetarium film Space Junk will screen one-time-only at 2pm in the Eos Planetarium Theater. This visually thrilling show traces the history of human-launched satellites and the origins of Space Junk, including some of the famous satellite collisions that have added to the growing ring of debris that orbits 22,000 miles above our planet. Along with the immersive sensory experience, the film also introduces Don Kessler the pioneering NASA researcher known as “The Father of Space Junk.” Guests of all ages will feel like they’re in orbit around the Earth as they discover the power of satellites and the perils of space junk in this special planetarium film (run-time: 38mins). There are many experts at the University of Arizona who collaboratively research space junk. They research ways to avoid it and ways to clean it up so that it will not menace satellites and future space activities. The panel of experts will answer questions from the audience immediately following the Space Junk film. 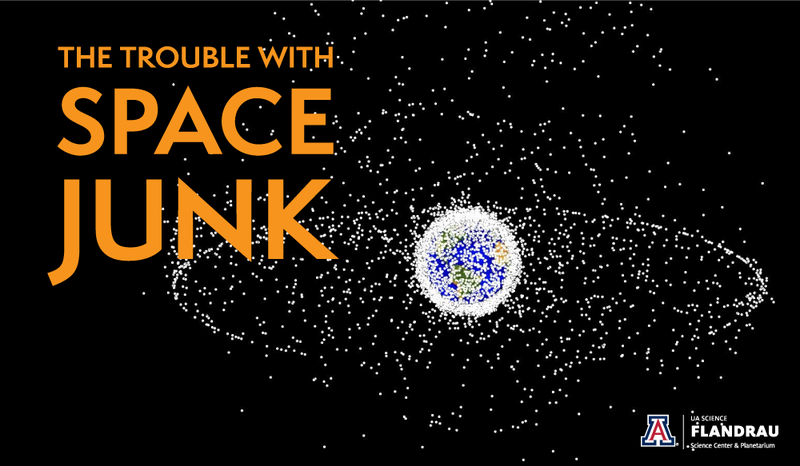 Come explore a new dimension of space science at The Trouble With Space Junk and discover the wonders of Near Earth Orbit.